Looking for the ultimate store for outdoor activity merchandise? Columbia, online at Columbia.com, is your perfect source. At this store, you can shop by activity, with merchandise for activities such as fishing, hunting, water sports, winter sports, and trail activities. Plus, Columbia has their own line of technologies for warmth, dryness, coolness, and protection. Head over and start shopping the wide variety of men's, women's, and kid's apparel, footwear, equipment. Plus, be sure to stop by RetailSteal.com for amazing Columbia savings, Columbia.com codes, and Columbia discounts. Columbia ships within the United States as well as to select international locations. This store offers a flat rate shipping of $6 but exclusions may apply. See website for more information. Enjoy up to 50% savings at the Columbia Sportswear Outlet. Click here to shop and save. Shop at Columbia Sportswear and enjoy up to 50% savings on men's apparel. Shop online at Columbia Sportswear and enjoy free shipping with your Greater Rewards membership. Shop for women's apparel at Columbia online and enjoy up to 50% off. Save 1000 points with your rewards membership and Columbia will give you a free $5 reward. 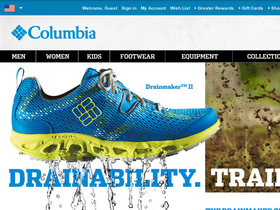 Act now and enjoy a 40% discount on select men's footwear from Columbia online. Shop at Columbia Sportswear and enjoy $6 flat rate shipping. Click here to shop. Become a Greater Rewards member at columbia.com and earn 10 points for each $1 spent. Get 50 points at columbia.com for sharing posts about Columbia Sportswear on Instagram. Member exclusive only. Enjoy 50 points at columbia.com for retweeting their posts on Twitter. For members only. Become a member at columbia.com and easily get 500 additional points for each follow on Twitter.